Let Purex start your new year off in style! We’ll take care of your new wardrobe and detergent needs for all of 2014. 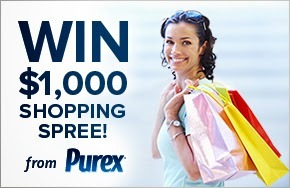 Enter to WIN $1,000 towards a new wardrobe and a year’s supply of Purex detergent! Wow what a great prize! To enter click on the below link and good luck!